My feet were going over both the slushy puddles and the ice. When I opened the mailbox, I saw the letter. It read "Honors Program" above the college's name in the top left corner. My feet skipped over both the puddles and ice as I literally ran inside. My heart was pounding, but my stomach was filled with an ocean of dread and apprehension. My mind was coated in doubt, but my heart wouldn't stop beating hope. It didn't take long. "We're sorry, but we are unable to accept everyone who applies." My mind's doubt was icing into cold, numbing fact while my heart moved from beating hope to bleeding disappointment. I knew it was doubtful. Only fifteen people out of the entire incoming class are selected, and my APA stylistic mishap had been haunting me during the final days of waiting. I had not been able to rid myself of the hope, though. A different school, nicknamed "the Harvard of the Evangelicals," had already accepted me and even given me their highest academic scholarship. My ACT score allowed me to apply for this elitist program. I was co-presidnet of the National Honors Society, for Pete's sake. Yet, I was facing "you're a good candidate for our 'second-chance' opportunity." I dropped the letter and turned away. 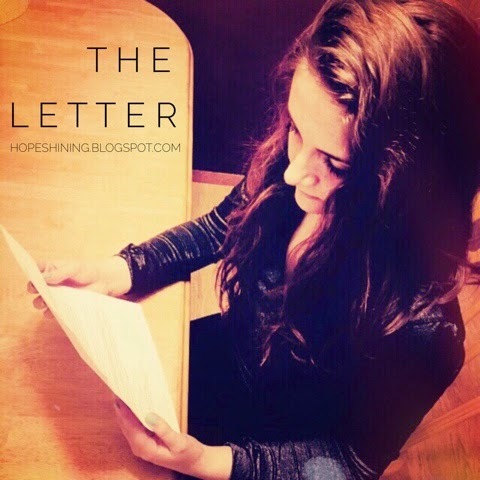 I dropped the letter and felt my hope drop to the floor. I turned away and felt like my dreams had totally turned away from me and left me in a place unable to engage in the shattered reality I now faced. I would like to say otherwise, but it's just the truth: this rejection letter felt like it broke a dam inside of me that allowed a flood of held-back doubts and too-long held fears to pour out. This was supposed to be the final confirmation that I should go to this school. I prayed. I prayed, yet this is the result that I get. again. My family literally can't afford the practically $18,000 that this is going to cost us; doesn't God understand that? Why, why is the effort (forget about my own effort) of my parents yet again seemingly unrewarded? Why do I have to deal with all the doubt and baggage that this is going to cause me from this day forward? I. do. not. have. the. strength. Why do I have to carry and work through what this is bringing up in my life? When can it just be what I wanted? Tears are an interesting reality. Although it may feel like they are drowning you, they're often just washing you clean: washing you clean of gunk that has been building up inside. Sometimes, something as strong as a torrent of tears is the only thing that can wash that buildup out. When the buildup was coming down, I see this: we're not built to stand alone. When the hope was dropping to the floor, I see this: maybe our hope should start at the floor. It should start beneath us and be grounding us. It should be an anchor for our soul, and this is not an anchor that 'ties us down' but one that enables us to stand up (Hebrews 6:19). When my whole reality seemed to darken, I see this: God is light, and in Him, there is just no darkness (1 John 1:15). Isn't that enough? When my life seems shaken, I see this: though the hills be shaken and the very mountains move, His steadfast love just isn't going to change (Isaiah 54:10). Doesn't that steadfast love still have you covered even when, hey, it seems like it's forgotten about you? When my heart is bleeding and I don't think I even have the strength to cover the wound, I see this: when I am weak, oh man, then is when I am actually strong (2 Corinthians 12:10). When life brings you through solid ice of doubts, fears, and crumpled dreams, I see this: life has both the pain and cold and danger of ice, but there is always the melting of this ice where the pain will fade, and you will find that you are stronger for enduring the ice. Really, though, both ice and melting puddles are made of water, but they just come in different forms. And both are good. Now, that letter is now sitting not even eight feet away from me. I wanted to burn it not even a week ago. Today, I want to frame it. Call that strange desire swap what you will - character defect, bizarre tendency - but I've seen that in the dark tears of weakness are the brightest cleansings of His strength. And I don't want to forget that. Update: The day after receiving the honors program rejection letter, I got a phone call. The leadership development program that I'd applied to at the same school had accepted me. Frankly, this program is the better fit for me at this point in my life, and it is highly doubtful that I would have been able to be in both programs. Yet, I had to live through an emotional hell before finding out this news. But, my God is the God of heaven, and I want to encourage you: hang on. He's just not finished yet. Just went through a similar phase Deborah! I had to make a stand for the lord! This actually backfired and I wasn't selected for my job! My family also going through hard times and I needed this Job! But Jesus is more important than those cankerworms! But God is with us! He always gives his BEST for his Children! I'm glad he leading all of his children through the valley for his Name's sake! When God opens doors no man can shut and when he closes doors no one can open!